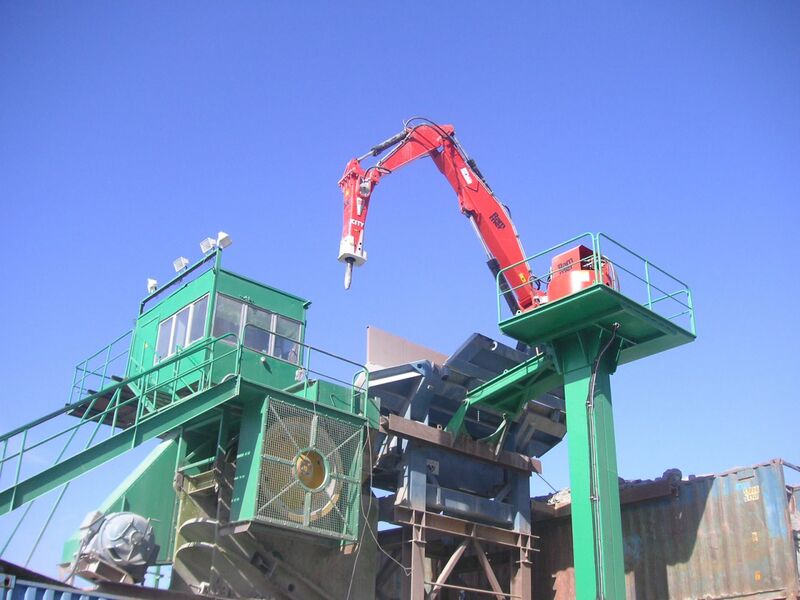 Pedestal mounted hydraulic boom systems are typically installed above crusher inlets or ROM hoppers and grizzly screens to minimise downtime and avoid damage caused by oversize product blocking chutes or crusher inlets. A correctly sized hydraulic rockbreaker and suitably positioned boom system is a well-recognised, safe and reliable solution which can maximise the productivity of any crushing circuit. ​The physical size of the chute or crusher inlet. Put simply- 'the bigger the rockbreaker, the greater the impact energy'. If the hydraulic rockbreaker is too small, it will take longer to break rock and clear blockages, resulting in unnecessary and costly downtime. However, if the hydraulic rockbreaker is too big it may be too large to fit into the crusher throat or chute where blockages are likely to occur. Importantly, if the rock hardness is too low for the selected rockbreaker, it can actually cause damage to the rockbreaker. Instead of the tool impacting and imparting energy into the rock, the tool easily passes through the rock and is captured by the tool retaining pin, effectively causing the energy to be 'absorbed' by the rockbreaker itself rather than delivered to the rock. By considering all aspects of the application, including rock hardness, rock size, expected duty and the space available, an experienced dealer can recommend the most suitable hydraulic rockbreaker for the application ensuring the best possible return on investment. Additionally, careful attention should be given to the rockbreaker design and location of hoses, particularly if working within the tight constraints of a chute on within a ROM dump hopper. Top entry hoses and a rockbreaker design which eliminates exposed hose swivels is always preferred. Side swivels can be easily damaged by impact with chute walls and designs with long hoses hanging from the side can easily get caught on rocks and chute work and should be avoided. Secondly, the boom size and reach must be correct. Once the optimum hydraulic rockbreaker is selected, the boom system itself needs to be selected to carry the weight of the chosen rockbreaker and meet the reach requirements for the application. Additionally, consideration should be given to the expected operating duty and whether there is a need for raking rocks in larger chutes or dump pockets. If it is expected that regular raking of rocks and material will be necessary, a heavier duty boom system may need to be considered. Selecting a boom system that is too light for the application will lead to higher maintenance costs which accelerate over time, due to excessive pivot pin and bush wear and possible fatigue failures in structural components. The end result will be a reduced effective life of the boom. Conversely, over-sizing the rockbreaker and / or the boom system will increase the initial capital cost and have a flow on effect on the cost of support structures and foundations. Correctly sized booms which are operated and maintained correctly can achieve an operating life of up to 20 years or more. Thirdly, the position, elevation and working slew angle of the boom system need to be assessed. Having selected the most suitable rockbreaker and boom system, correct positioning of the boom can make a big difference to the useability and maintainability of the system. Ideally, the normal working area of the rockbreaker should be well within the maximum and minimum limits of the boom reach. This allows the boom to work with its hydraulic cylinders near mid-stroke, allowing for hydraulic cushioning of the hydraulic cylinders and proper operation of hydraulic relief valves, which are used to limit undue stresses on the boom. Not only is it essential to ensure that the boom system is capable of positioning the hydraulic rockbreaker in the locations where blockages are expected to occur, if raking or re-positioning of material is anticipated, the boom system should be orientated such that the rockbreaker can be used to 'rake' material in line with the boom rather than attempt to 'slew' material sideways. There is far greater force available for raking when in line with the boom (i.e. pushing or pulling the material) when compared to trying to slew material sideways. Ensuring that the boom can reach down far enough into the chute and then lift out sufficiently to clear chute walls, hand railing and other structures to move to park and maintenance positions is also very important. The expected normal working angle and the nominated 'park' position and maintenance location (for tool changes) will determine the required slew angle. Typical king-pin type slew designs have a slew range of 170 degrees and a recommended working angle of 140 degrees. For greater slewing capability, a 360 degree slew base may be required. Finally, the position of the boom system must also consider the location of the operator control cabin or operator platform. Visibility and operator safety while operating the boom system is extremely important and careful selection of an appropriate 'line-of-site' location for the operator should be determined. Lastly, but not least, the availability of advanced safety systems, remote operation options and of course, maintenance and spare parts should be considered. For increased safety and reduced downtime, consider an advanced collision avoidance system with automated movements such as the Total Rockbreaking Solutions BoomSafeTM system. This system incorporates Smart LimitsTM which provides collision avoidance in a true 3D environment. The optional Remote Operation module incorporates additional safety features to allow true remote operation of the boom system and integration with real time area safety controls. Options such as centralised or fully automatic greasing systems should also be considered to maximise the life of all pivot pins and rockbreaker bushes. Parallel type lubrication systems such as the Lincoln system available as a standard option on all Rammer boom systems (rather than series type grease distribution systems) provide an extra element of reliability. Finally, the availability and prompt delivery of spare parts is an important factor to minimise downtime. Using standard, proven boom system models which are manufactured regularly ensures that your boom system supplier will always have common parts in stock and available when required.